Dr. Victoria Todd within the 500-m fishing exclusion zone of an offshore O&G platform-rig complex in the North Sea. © OSC 2018. We are pleased to announce publication of our new 2018 paper entitled: Quantitative analysis of fish and invertebrate assemblage dynamics in association with a North Sea oil and gas installation complex’, in the journal Marine Environmental Research. The paper uses data collected using a Remote Operated Vehicle (ROV) to investigate fish and invertebrate assemblages on North Sea Oil and Gas (O&G) installations. Dr. Victoria Todd, one of OSC’s Directors, was lead author on this paper. The second author, Ed Lavallin, was one of Dr. Todd’s co-supervised students/interns, and a former staff member at OSC. The last author, Professor Peter Macreadie, from Deakin University in Australia, teamed up with OSC for this, and future scientific collaborative work. This is the second decommissioning paper Dr. Todd has co-authored with Professor Macreadie, the other entitled ‘Environmental benefits of leaving offshore infrastructure in the ocean’ was published in the journal Frontiers in Ecology and the Environment earlier in 2018. Both are downloadable from the OSC website. Current international policy requires removal of offshore infrastructure at the end of their operational lifetimes. 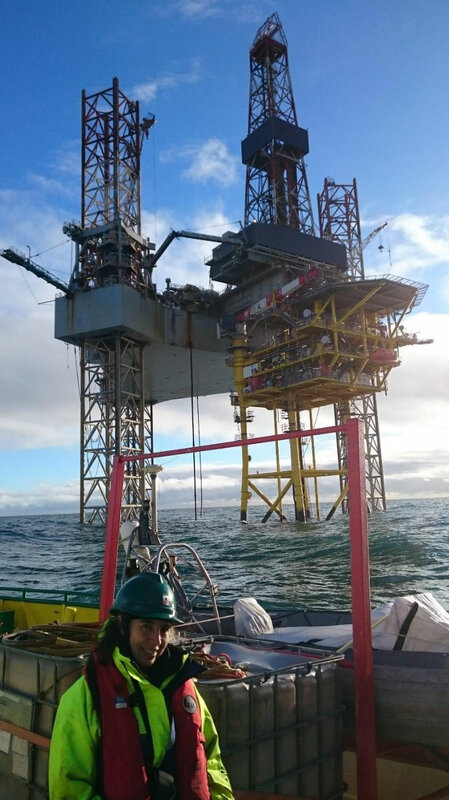 This is expected to cost billions of pounds over the coming years in the North Sea alone and has been questioned from an ecological perspective. These offshore structures provide hard substrate upon which marine organisms settle, which can go on to attract diverse assemblages of mobile invertebrates, fish and even potentially marine mammals. This study used ROV surveys to quantify and analyse fish and invertebrate assemblage dynamics associated with an O&G complex. We found evidence of clear depth zonation along the structures, which implies that two proposed methods of decommissioning (topping and toppling) could eliminate these unique communities. We also show that several species use the infrastructure for different stages of reproduction. This supports the argument that offshore infrastructure could be important areas where fish and invertebrates are produced as opposed to simply attracting these species. The abundance of life, coupled with observations of organisms using installations as vectors for reproduction, notably the first reported use of an anthropogenic structure for the lumpsucker fish, Cyclopterus lumpus brooding, demonstrates potential ecological benefit from the implementation of a rigs-to-reefs (RTR) decommissioning regime (possibly with implications for fisheries, ecotourism, and biodiversity) within the North Sea. Victoria L.G. Todd, Edward W. Lavallin, Peter I. Macreadie (Accepted): Quantitative analysis of fish and invertebrate assemblage dynamics in association with a North Sea oil and gas installation complex. Marine Environmental Research.